One of the Accidental Locavore’s big issues with granola is that it’s very hard to find any without nuts. Line a rimmed baking sheet with parchment paper (don’t try to be cheap here and use wax paper, you’ll be sorry…trust me!). In a large bowl, mix together the oats, coconut, brown sugar, cinnamon, ginger, salt, pine nuts, and sunflower seeds. In a small saucepan, over medium-low heat, melt the butter with the maple syrup. Pour the mixture over the oat mix and toss well to combine. Spread evenly on the baking sheet. Bake until golden, about 30 minutes. Stir every 10 minutes to keep it browning evenly. Remove from the oven and let cool. 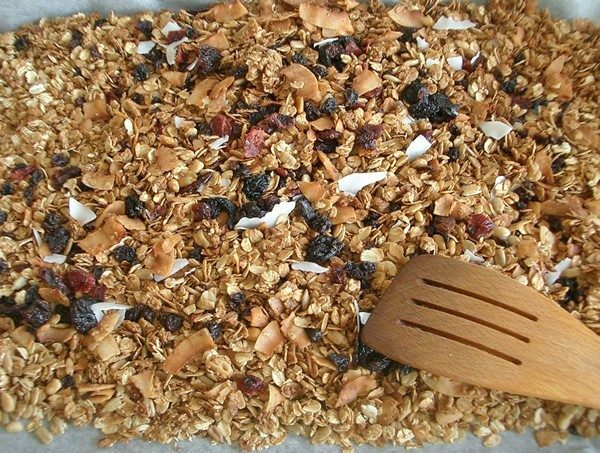 Add the dried fruit and coconut to taste and mix well. I use small handfuls of raisins, and chopped cranberries, cherries and apricots. Store in an airtight canister or a Ziploc bag. Serve straight-up or over your favorite yogurt and enjoy! My verdict: There’s always a canister of this granola in my cupboard. It’s really good and you can add or subtract whatever you’d like–even make it savory. Interestingly, the quality of the butter really makes a difference! It went from being really good to great when I switched to Plugra butter. I always use it on my yogurt and the dried fruit gets hard from the cold, so I usually chop it into small pieces. 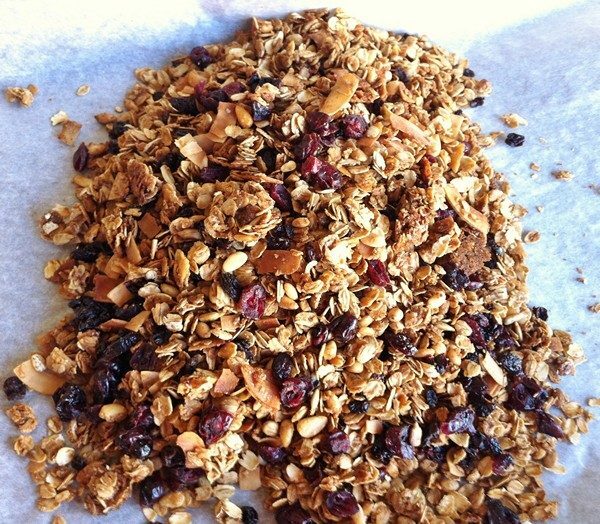 What do you like in your granola?